Notes: This Valletta plan was published by d’Aleccio in 1582 and re-engraved by Lucini in 1631. Indeed, when Lucini copied d’Aleccio’s plan, and not even the original d’Aleccio, he made some mistakes of transcription, and left out a few details. The pictorial image of Valletta was very well rendered by Lucini, yet the bastions of S. CHRISTOFORO and SANTA BARBARA were rendered S. CHRISTOFONO and S. BARBERA. D’ Aleccio showed in their proper position both the Albergio de Allemagna and La Castellania dove si tien Iustica, respectively marked Y and Z in the key to place-names. Lucini ignored the letter Z and he grouped the auberge and the seat of the tribunals together under number 22: Albergo di Alemagna e Castellania doue si tiene p[er] iustica; consequently, the edifice of the courts was placed with the auberge overlooking Marsamuscetto, instead of near the Conventual Church of St. John. Another mistake of substance refers to the armoury. On d’Aleccio’s plan it was marked Together with the bakery: FF. Il Forno d[el]la Signora et l’Armaria. The bakery was correctly shown by Lucini and Blaeu (numbered 54) in what is now Old Bakery Street, but the armoury was mistakenly transferred to number 56 which read: Case p[er] gli Sig.ri Priori e p[er] il Vescouo e l’Armeria, placed I the heart of the city, next to the Palace, where the chapel in the Bishop’s house was indicated with number 13. Lucini’s, Blaeu’s, and the Mortier’s plans must have gained an alarming impression of the “hidden agenda” of the bishop and the top clerics. Lucini omitted the references to the owners of the houses where d’Aleccio marked GG, HH, RR and ZZ, those marked CC and EE were left incomplete under numbers 25 and 27, while Casa del S. r Auogadro (marked MM), quite a common name among the Italian Knights, became a lawyer’s house: Casa dell Sig.r Auocato (marked number 31). The omission by Lucini of the house of Duero, Poio, Pietromelico and Ladosa may have a relative importance, but the omission of the Casa del Ingegniero et Arch[itett]o (marked HH) is rather surprising, even if Lucini did not know the name of the engineer and architect to whom it referred. This can be none other than Girolomo Cassar, the engineer who completed Laparelli’s fortifications, churches, palaces, houses and auberges in Valletta. During d’Aleccio’s presence in Malta, on 27th June 1577, Cassar had received by way of donation from the Grand Master a plot of land in Quartiere 31 which was bordered by what are now Melita, St. Ursula, Soth and St. Paul’s streets. The house marked HH stands at the corner of St. Ursula Street and Melita Street, which were at the time Strada San Pitro and Strada Pia. The engraving is a planimetric presentation of Valletta which in 1631 was still considered “citta` nuova” (new town). 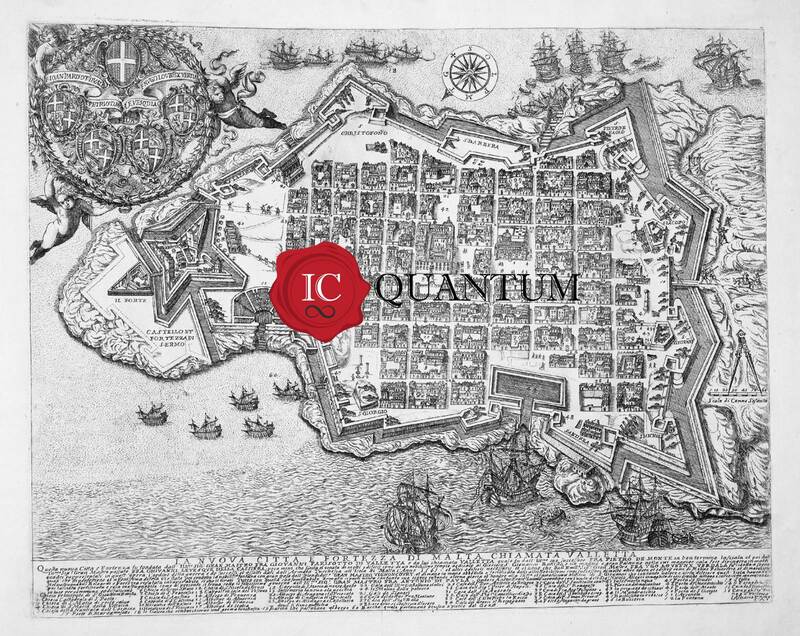 Valletta was founded in 1566 by Grand Master de la Vallette the very next year after the Great Siege, partly in response to weighty strategic reasons which had made themselves felt in the course of those military operations. It was conceived as a “citta fortezza” (a fortress city) and in fact top priority was first given to the encircling ring of fortifications. Lucini’s map shows as a star-shaped Fort St. Elmo at its eastern extremity. The designing architect, Filippo Lapparelli, conceived it on a classical grid plan. By 1631, Valetta had already acquired most of its architectural features and was home to thousands of inhabitants.